Yesterday, I was reminded of the part of the nativity story which recounts that “the shepherds were abiding in the fields” (Luke 2:8) when I had the opportunity to meet this shepherd in the fields near Bethlehem. His name is Hajj Ali, which means that he has been on the Muslim hajj pilgrimage to Mecca, Saudi Arabia. And unfortunately, in contrast to the shepherds of Luke 2, Hajj Ali only recognizes Jesus as a prophet and not yet as the “Saviour who is Christ the Lord” (2:11). He was a friendly man who told me that he had been grazing his sheep in this area for more than 50 years. He seemed very pleased that I would stop and talk with him, though it was challenging because he only speaks Arabic. We did the best we could and had a friendly exchange. I asked if I could take some pictures, and he gave me his approval, but suggested that I should give him some money for doing so. I dug around through the change in my pocket and found a 10 shekel coin and put it into his weathered hand. I understood from his grunts and hand gestures that 10 shekels wasn’t enough; he wanted the rest of the change in my hand, which all together totaled about 12 1/2 shekels. A small price to pay for the nice photos that I got and the joy that my daughter Grace had running amongst his sheep. 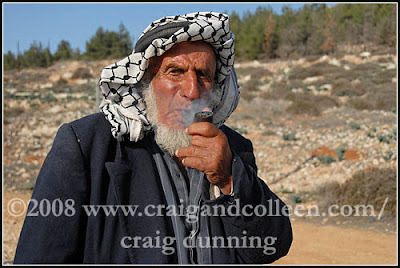 If I understood him correctly, he intended to use the money he got from me to buy some tobacco for his pipe, which was a prominent feature in most of the photo-opps he offered. This is our manger scene, which was carved in Bethlehem. It may not resemble the reality of what Joseph and Mary experienced, but it is a precious reminder to us of the meaning of Christmas: God’s Son humbly became God in the flesh. We hope that you have a very Merry Christmas! 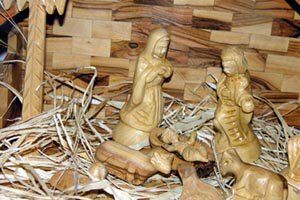 December 25 has long been the recognized date for western Christians to celebrate the birth of Jesus Christ. Please take note of the wording of the previous sentence: “…recognized date…to celebrate…” I didn’t suggest that it is the actual date of his incarnation, though I’m not opposed to the possible accuracy of such a date. The distinction is important because there seems to be annual discussions surrounding the inaccuracy of the December date, and these discussions typically include two points of proof: The alleged pagan origins of Christmas and the details about the shepherds in Luke’s birth narrative. So common is the assertion that Christians simply co-opted the date of the pagan celebration of the winter solstice, even among many pastors, that it is almost unthinkable to consider another possibility. As evidence of the pagan origins of the holiday, the date and the use of trees in the traditional celebration of Christmas are generally the main offerings. Clearly, this isn’t incontrovertible evidence that Jesus was born on December 25, but it should cause one to pause before accepting as fact that celebrating Christmas on December 25 is simply following a pagan custom. The second issue is more interesting to me for the symbolism that it offers. According to the Gospel of Luke (2:8), on the night of Jesus Christ’s birth, in the region of Bethlehem, there were shepherds out in the fields watching over their flocks. In the annual discussions about the actual date of Jesus’ birthday, Luke’s account is frequently offered as proof that clearly eliminates the possibility of a December 25th date for the birth of Jesus. Those who use Luke in this manner typically point to two facts: Location and time. The shepherds were in the fields at night. It is interesting to me that people offer this as “proof” that Jesus couldn’t have been born in December, as though the weather patterns in and around Bethlehem are as definite as, for example, those in the Arctic Circle. The fact is that the weather in this area is not so definite. No doubt, sometimes December nights might be too cold and wet for shepherds to be in the fields. This year, interestingly enough, might be one of those since snow is in the weather forecast. However, while December is clearly within the period correctly designated as the “rainy, winter season,” it isn’t a foregone conclusion that the weather conditions around Bethlehem will be either rainy or cold. On this ground alone, this is a weak argument against the possibility of a December 25th birth of Jesus. More interesting to me, though, is what I discovered some years ago as I considered this topic. According to Alfred Edersheim , his reading of the Mishnah  led him to conclude that the sheep kept around Bethlehem were, in fact, kept in the fields through the winter because they were sheep designated for slaughter at the Temple during Passover. Consider the symbolic significance of Edersheim’s suggestion: The shepherds standing watch over sheep destined for the Passover sacrifice were suddenly visited by the angel of the Lord who was announcing the birth of the Savior, who John later identified as the lamb of God. Yes, Jesus, the Lamb of God, destined to be sacrificed for the sins of the world at Passover, was born in Bethlehem, where the Passover lambs were traditionally raised. So, next time someone tells you, “We know that December 25 isn’t the actual date that Jesus was born” you might offer that the evidence may not be so clear. In any case, wish them a merry Christmas and make sure they clearly understand the significance of the fact that God became flesh – that the Lamb of God was born in Bethlehem. Edersheim, Alfred. The Life and Times of Jesus the Messiah. Hendrickson Publishers, Peabody, MA. n.d. Book I, pp. 186-187. The Mishnah is the Jewish oral law, and is now collected in written form. Since writing this post, I have found some others who have integrated Tighe’s assertions in a good way. See the New Covenant blogspot here.